The technologies and expertise developed by the APPF are world-leading, internationally recognised and have ensured Australian science is an attractive partner for international collaboration. 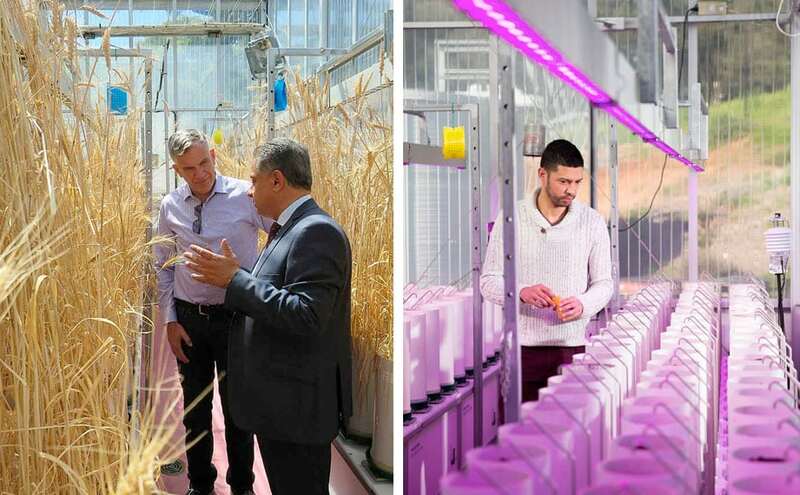 The APPF operates a geographically distributed model with facilities at the University of Adelaide, at CSIRO in Canberra and at the Australian National University – three internationally renowned plant research organisations. Each node has unique specialised facilities that interlink to provide a complementary, seamless service to users. A “research hotel” approach provides opportunities for more distantly placed researchers to utilise the facilities either in person or remotely through engagement of APPF staff (from applying for quarantine permits through to planting and management of research projects), while mobile equipment is available for field deployment anywhere in Australia. 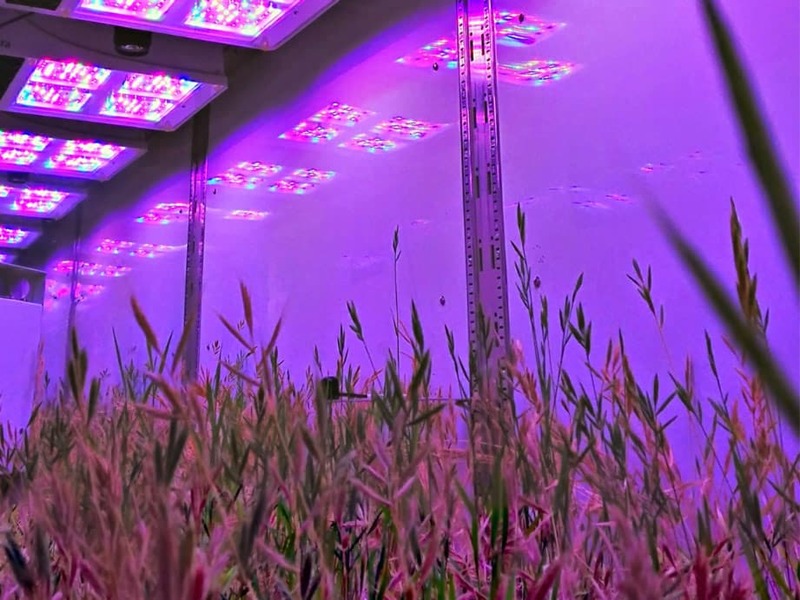 The APPF provides the full spectrum of modern growth facilities, from temperature controlled greenhouses through to state-of-the-art, automated, high-throughput and deep phenotyping technology in large-scale Smarthouses. State-of-the-art, fully controlled growth rooms and chambers, which provide precision climates including programmable temperature, lighting and humidity, are available at all APPF locations. 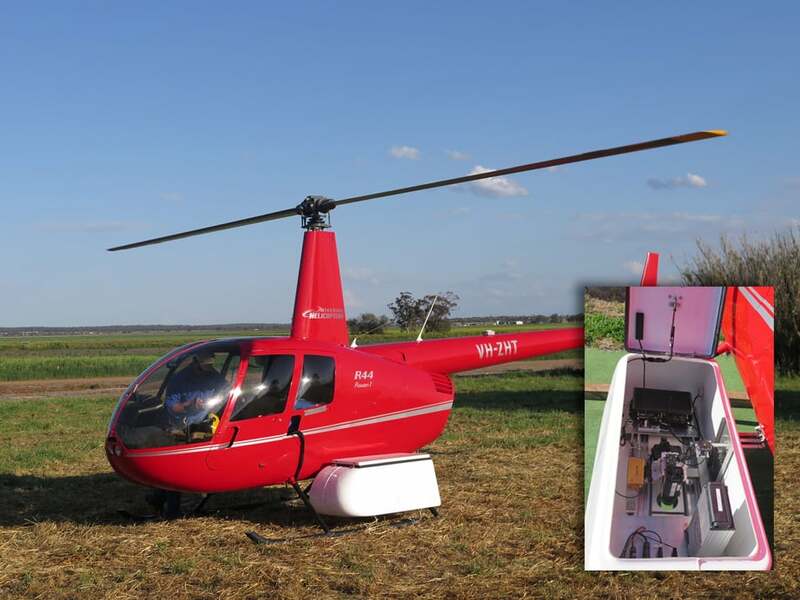 The APPF provides a suite of static and mobile cameras and sensors to support high-throughput and deep phenotyping in the field from the air and on the ground, including Phenomobile Lite, UAVs and large scale crop phenotyping and analysis. An extensive range of the latest portable phenotyping analysis and data collection tools to measure leaf area and photosynthesis through to chlorophyll and light in the field or in the controlled environment are available for hire from the APPF. 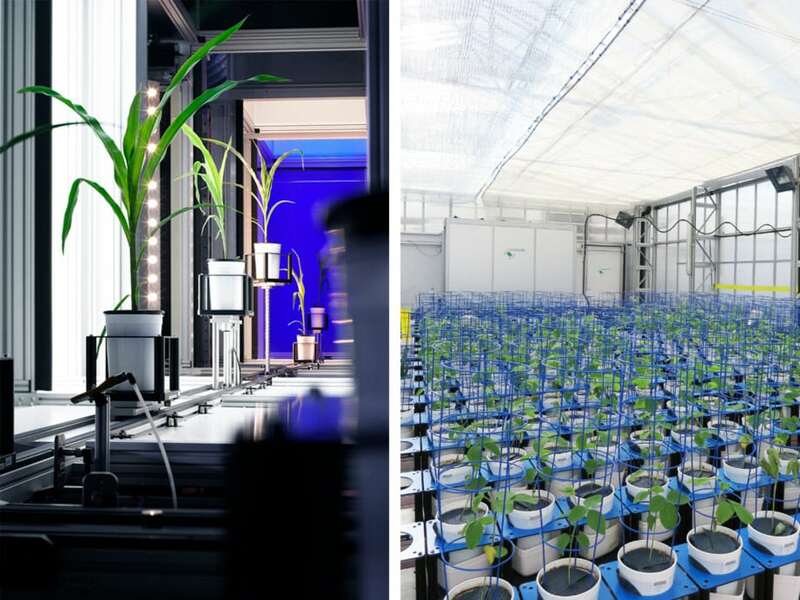 The APPF provides the full spectrum of modern growth facilities, from temperature controlled greenhouses through to state-of-the-art, automated, high-throughput and deep phenotyping technology in large-scale Smarthouses. See two sections below for further information on our greenhouse and growth room facilities and some additional, unique phenotyping technology available in some of these controlled environments. Suitable for: All plant types ranging in size from 10cm through to 1m in height. Hyperspectral imaging: Download the factsheet. Smarthouse specifications: Download the factsheet. For more information: Please contact our experts to discuss how your research might benefit. Pricing & availability: Please contact us by e-mail or on +61 8 8313 1137. To book: Please submit a booking form. Specim VNIR and SWIR hyperspectral cameras to capture the spectral reflectance of plants from 350-2500 nm. 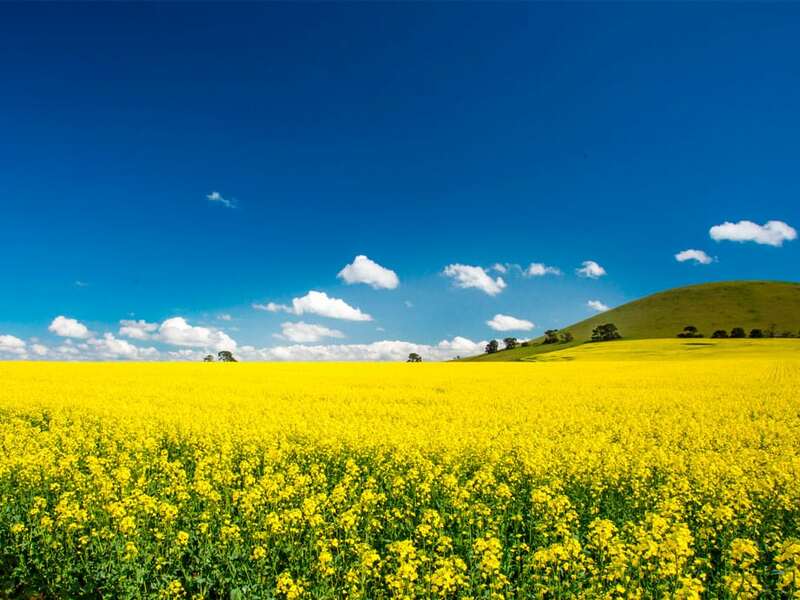 The hyperspectral reflectance data can be used to non-destructively measure a whole range of plant constituents, including nutrients, water or other aspects of plant physiology as long as a distinct spectral signature can be analysed. Suitable for: Most crops and plants. For more information on the LICOR Li-191 quantum line sensor. For pricing, availability or more details: Please contact us by email or on +61 2 6218 3430. Request for service: To submit a project please complete the request for service form. The Cropatron glasshouse has a high degree of environmental control, PC2 level of containment, one quarantine certified glasshouse, high resolution monitoring and complements the Field Cropatron. 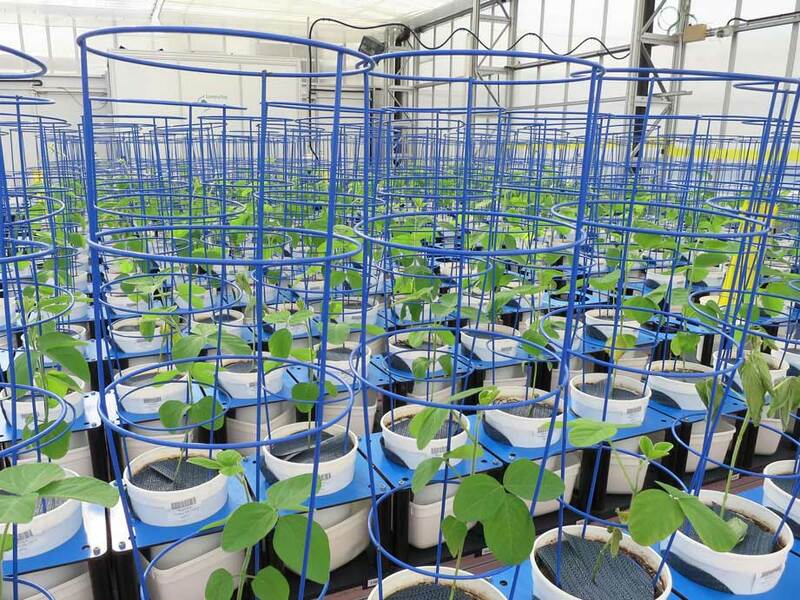 Plants are grown in large tubs of approximately 1m3 whilst tubs are mounted on lysimeters for water balance measurements and scanned by robotic controlled imaging systems from above. Four chambers are available for individual control of CO2 level, temperature and humidity, each chamber containing up to eight tubs. Gas flow to and from the chambers and data cabling communicates through the gantry and services rail to the analysis laboratory containing infrared gas analysis and IT infrastructure for data capture. allowing quantification of plant growth and function at canopy level. Suitable for: All plant types. For more information: Please contact us by e-mail or on +61 8 8313 1137. To book: To make a booking, please submit a booking form. Procedure for growing non-GM plants information sheet. The Plant Accelerator contains 34 greenhouses in PC2 and non-PC2 areas ranging in size from 24 to 48 and 72 sqm. Some greenhouses are quarantine approved to allow plant growth from imported seeds. The greenhouses are fitted with evaporative and/or refrigerated cooling. Variance in temperature in the greenhouse can be pre-programmed to reflect external conditions (e.g. cool nights, moderate mornings, hot afternoons). The greenhouses’ double glazed acrylic skin provides good insulation properties and transmits the entire spectrum of UV light, ensuring that internal environmental conditions are as close as possible to those in the field. For more information: please email or phone +61 2 6125 8319. To book: please fill in our web form to request a booking. 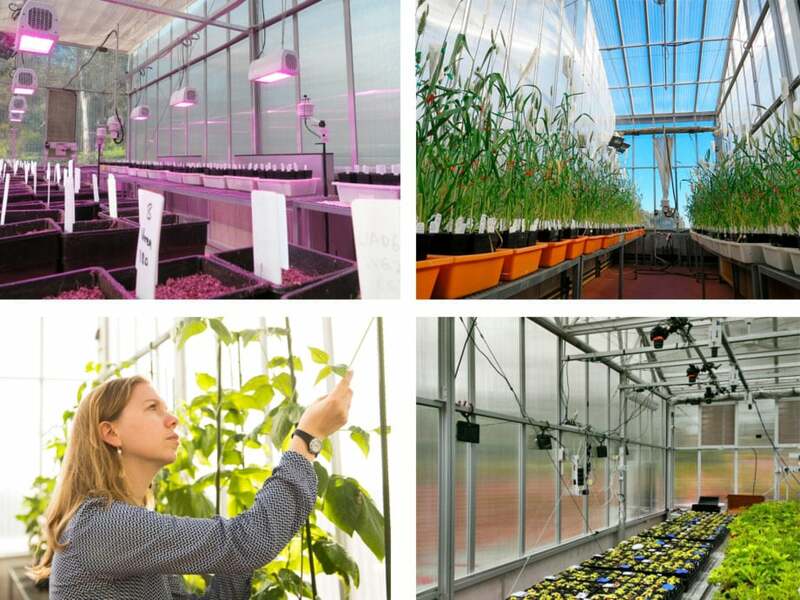 The APPF at ANU hosts a modern greenhouse facility consisting of 6 rooms which includes precision environmental control and top down RGB real time imaging of plant growth to analyse genetic variation in water use efficiency in plant growth. A glasshouse balance array has also been developed which provides real time pot weighing services to clients. You can view some demonstration data of the weighing system on this here. Non-GM procedure for growing non-GM plants in the DroughtSpotter information sheet. The DroughtSpotter is a gravimetric platform with precision irrigation to assess transpiration dynamics of plants with a precision of up to 1g. The integrated irrigation units allow precise and reproducible water application for drought stress or related experiments that require an accurate control of water volume to 1ml. The individual pot weight can be up to 12kg. The platform is installed in an existing greenhouse and comprised of 168 load cells for which watering protocols or drought scenarios can be easily customised. The designed irrigation events maintain the target weight of each individual plant pot according to the researchers’ experimental protocol and provide plant transpiration rates at high temporal resolution calculated by the loss of weight. For more information: Please contact Trevor Garnett to discuss how your research might benefit. To book: Please submit a booking request. PlantEye uses a laser light section to acquire 3D point clouds of plants. 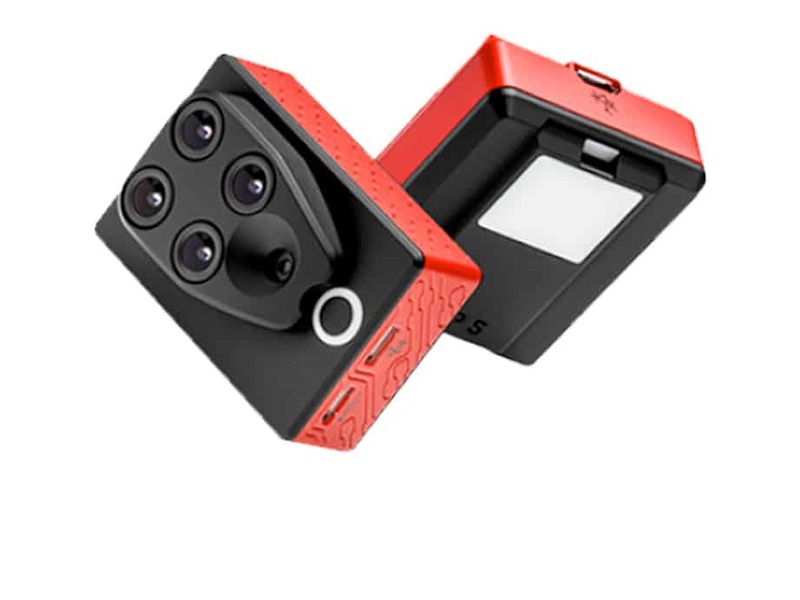 It projects onto the plant or plant canopy a very thin near-infrared laser line, which is reflected and captured with an integrated camera that is mounted at the other end of the PlantEye sensor. The projected laser line shifts based on its distance towards the sensor, and a record of those shifts is then used to generate a height profile of the plant. By moving the sensor over the plant, or by moving the plant relative to the sensor, you get multiple height profiles which are merged together to form a 3D model of the plant. 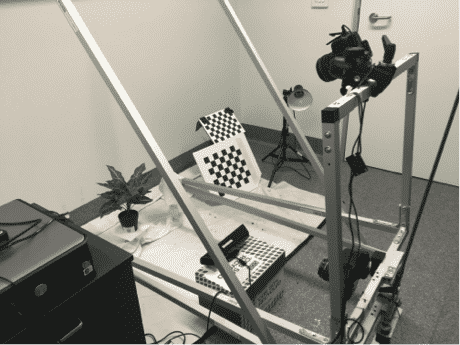 In a second step, the sensor segments this 3D model, recognizes plant organs and computes a diverse set of morphological plant parameters within less than a second. Suitable for: Most plants, sizes ranging from seedling up to 1.2 m in height. PlantScan provides non-invasive analyses of plant structure (topology, surface orientation, number of leaves), morphology (leaf size, shape, colour, area, volume) and function by utilising cutting edge information technology including high resolution cameras and three-dimensional (3D) reconstruction software. The next generation phenotyping platform, PlantScan captures information on plant structure and function on an industrial scale enabling the discovery of new traits and the selection of varieties for tomorrow’s agriculture. Multi-wavelength imaging for pigment or chemical composition spanning both visible and near-Infrared. During image acquisition, the system is closed to ensure reproducibility of imaging conditions. Lighting in the chamber is generated by a fluorescent light that is diffuse to approximate Lambertian conditions within the imaging chamber. The system uses standard industrial components from reliable manufacturers with worldwide service. 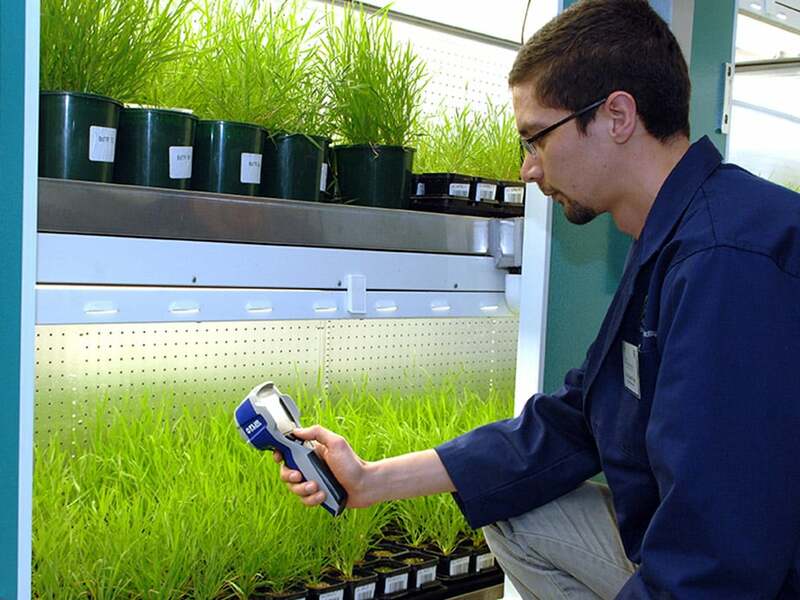 PlantScan is able to scan very small seedlings or plants, from a few centimeters to a height of 1.2 m and up to a meter thick, with equal accuracy. Data are captured with their contextual information and collated into one multi-layer data file before being stored in a purpose-built database. Suitable for: Most small plants. This stripped down version allows labs around Australia/overseas to have access to affordable, basic 3D capability. All three APPF locations offer state-of-the-art growth chambers and rooms, with some offering phenotyping capabilies including TrayScan, PlantScan and hyperspectral scanning. 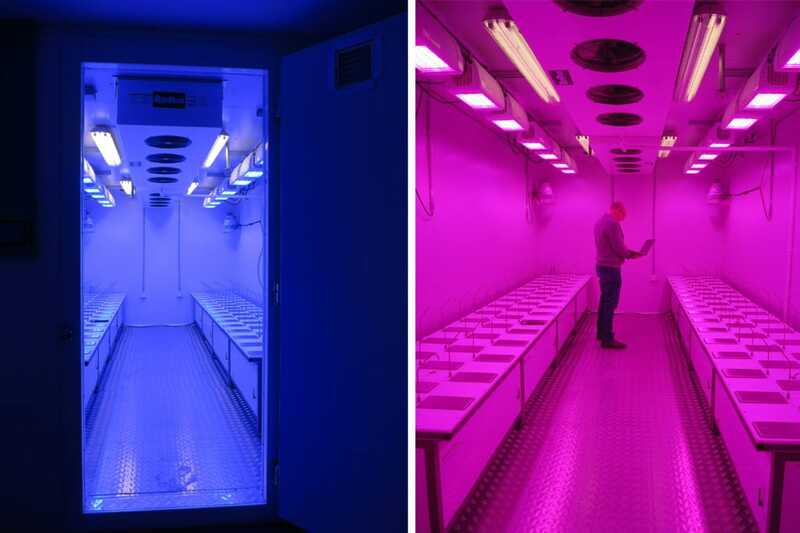 This unique capability consists of two Conviron controlled environment rooms (CERs) specially fitted with temperature and humidity control, variable wavelength LED lighting up to 1000 µE.m-2.s-1 and Phenospex DroughtSpotters. DroughtSpotters are fully automated gravimetric platforms with high precision irrigation to 1ml, enabling the maintenance of target weights of individual plant pots according to the researchers’ experimental protocol and the calculation of plant transpiration rates at high temporal resolution based on weight lost. 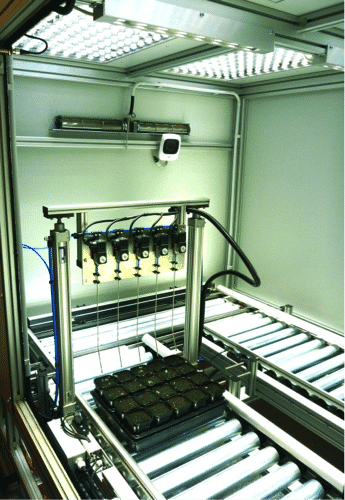 The unique twin CERs, comprising 96 load cells per room, enable parallel experiments for which watering protocols or drought scenarios can be easily customised. The individual pot weight can be up to 15 kg. Controlled environment growth chambers and rooms are designed to provide precision climates (e.g. programmable temperature, lighting and humidity). These are available for use at all of our locations. Suitable for: Model through to crop plants. Specifications: Information about lighting, temperature and layout specification sheet. For more information, pricing and availability: Please contact us by e-mail or on +61 8 8313 1137. The Plant Accelerator offers a number of environmentally controlled growth rooms and growth chambers in PC2 and non-PC2 areas. The growth areas of the walk-in-rooms range from 7, 11 to 20 sqm, whilst the reach-in chambers have a growth area of 2 sqm. Additive humitidy is available in all rooms, whilst some of the rooms have additive CO2. Suitable for: Seedlings and small plants. A range of Conviron plant growth cabinets are available enabling research projects that require accurate climate controlled environments. Standard 1-tier and 3-tier growth cabinets are available as well as enhanced SpectralPhenoClimatron (SPC) chambers. These enhanced chambers are equipped with 7 Heliospectra LEDs and 10 band LED lights, top down nIR, DSLR RGB and time lapse imaging, and simulated climate control. Suitable for: small plants and seedlings. 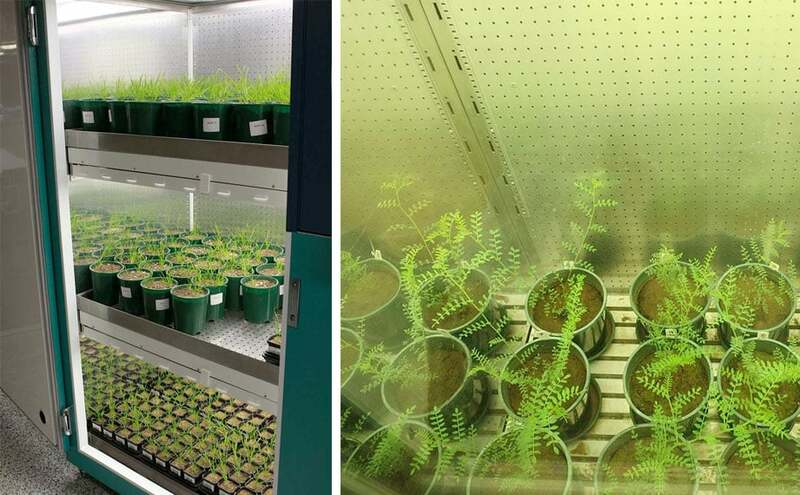 The APPF at ANU has a range of Conviron plant growth cabinets enabling research projects that require accurate climate controlled environments. Standard 1-tier and 3-tier growth cabinets are available as well as enhanced Spectral Pheno Climatron (SPC) chambers. These enhanced chambers are equipped with 7 Heliospectra LEDs and 10 bands LED lights, top down nIR, DSLR RGB and time lapse imaging and simulated climate control. Suitable for: A wide range of plants from seedlings to mature wheat, rice, tobacco, tomates, etc. For pricing, availability or more details: Please email or phone +61 2 6125 8319. To book: Please complete our web form. The SPC climate chambers provide real-time climate control, replicating any natural environment dynamically (for example the chamber can replicate the conditions of an environment from sunrise to sunset including light spectrum changes). The high throughput system enables visual growth phenotyping of up to 320 plants per chamber in 7 climate chambers. SolarCalc software controls light intensity and color, temperature and humidity at 1-minute intervals. This enables the creation of dynamic growth conditions with diurnal and seasonal cycles from any location. TraitCapture is a “seeds to traits” pipeline which allows users to track seed/genotype selection, set growth conditions, and analyze phenotypic variation for heritable components through to mapping causative loci via GWAS and QTL analysis. Suitable for: Seedlings or small plants. For more information, pricing and availability: Please contact us by email or on +61 2 6218 3430. CabScan is a robot gantry system mounted to the ceiling of two of our Conviron growth chambers. Each robot consists of two RGB camera imaging systems and one infrared (IR) camera. The stereo RGB camera configuration allows for 3D reconstruction of the plants, to which the IR image is co-registered. Suitable for: All plants growing in growth chambers. This imaging system is currently integrated into two growth chambers but will soon be offered in all APPF Canberra (CSIRO) growth chambers. 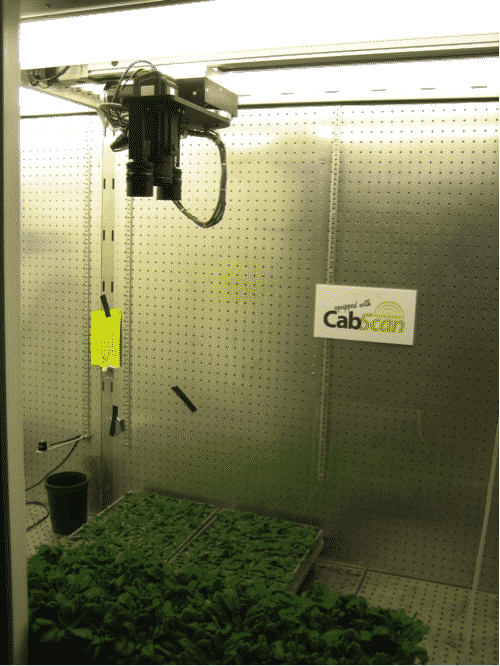 The CabWatch system offers an affordable method for time lapse video creation of plants in the growth chambers. The system is configured to measure plants from emergence through to seedling stage and real time visualisation can be viewed via PhenoSMART. Our first Growth Capsule has arrived and is undergoing set up and testing. The balance will arrive early 2019. These capsules are another excellent capability for phenotyping plants in a fully controlled environment. We will update this page once our Growth Capsules are ready for hire. Hyperspectral scanning is available in conjunction with the growth chambers and rooms, as well as the SpectralPhenoClimatron chambers. Location: Canberra (CSIRO) and Canberra (ANU). CSIRO – Please contact us by email or on +61 2 6218 3430. ANU – Please email or phone +61 2 6125 8319. CSIRO – To submit a project please complete the request for service form. ANU – Please complete our web form. Suitable for: Small plants like Arabidopsis, Brachypodium to mid size plants. A non-destructive conveyor based high throughput plant analysis system which is automated integrated and robotic. The system incorporates thermal, RGB and fluorescence imaging and is capable of processing 15 trays per hour (2,500 plants per day). 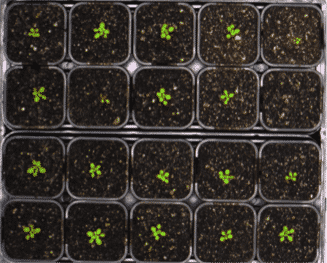 TrayScan allows users to conduct automated high throughput screening of plants measuring photosynthetic performance. Chlorophyll fluorescence kinetics measures photochemical efficiency and can provide information on plant growth and yield. UAV/drone/manned aircraft field phenotyping is available across the three APPF nodes. Suitable for: All crop plants. Hyperspectral imaging and data analysis: Download our factsheet. For more information: Please contact us by e-mail or on +61 8 8313 1134. Research project requests: Please complete and submit the booking form. 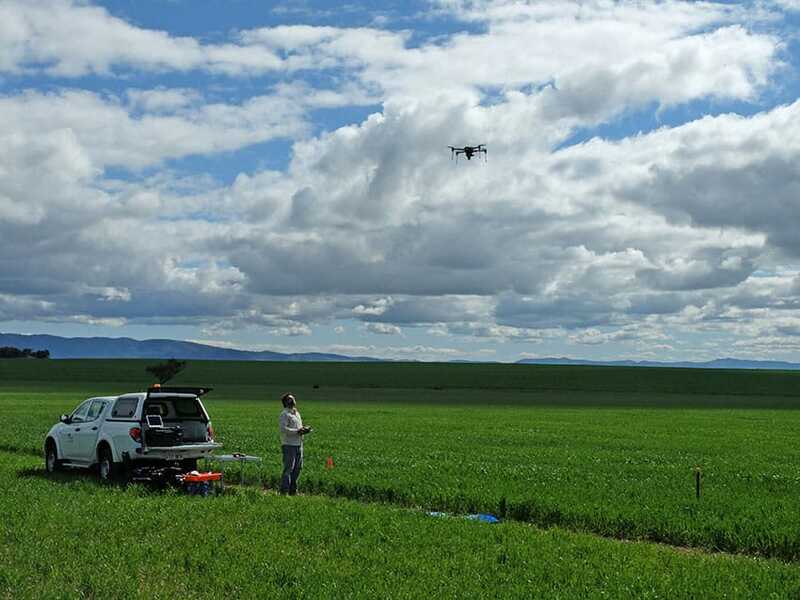 In partnership with the URAF (the University of Adelaide Unmanned Research Aircraft Facility), we provide improved phenotyping capabilities to support plant and agricultural science. Platforms range from multi-copters to fixed wing aircraft, carrying cameras and multispectral and thermal sensors. Images captured produce GIS layers used to integrate with field data to further develop relationships between plant growth, environmental conditions and plant treatment. The potential to measure parameters on field trials such as establishment, height, biomass, stress and nutritional status can be explored using this technology. 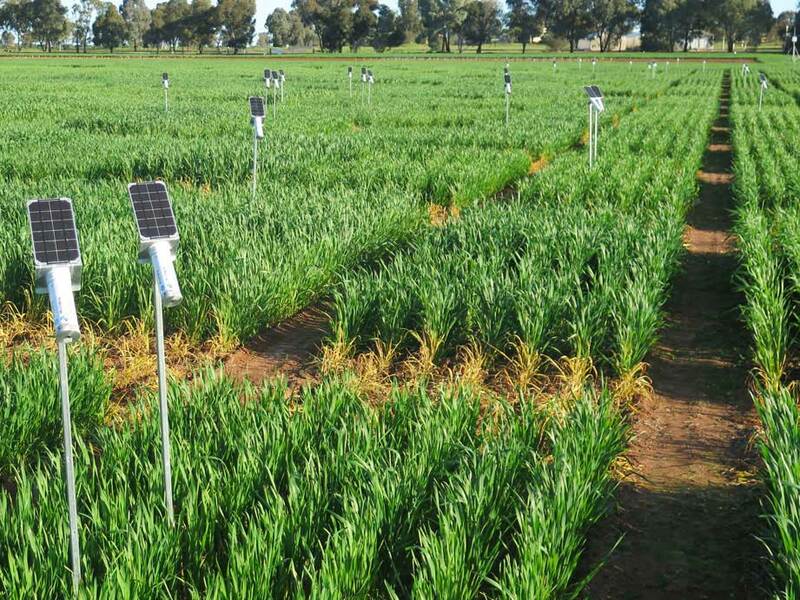 As part of the ARC Wheat Hub, methods are being developed to enable phenotyping of single row plots. Request for service: Please complete our web form. Suitable for: Use on drones/UAVs with all crops types. For more information about Parrot Sequoia. The Parrot Sequoia multispectral sensor offers a comprehensive, adaptable solution that is compatible with all types of drones. With its two sensors, multispectral and sunshine, the Sequoia analyses plants’ vitality by capturing the amount of light they absorb and reflect. Collecting this data means that farmers can do what’s best for their fields. Suitable for: All crops when measurement of canopy temperature at a broad scale is required. 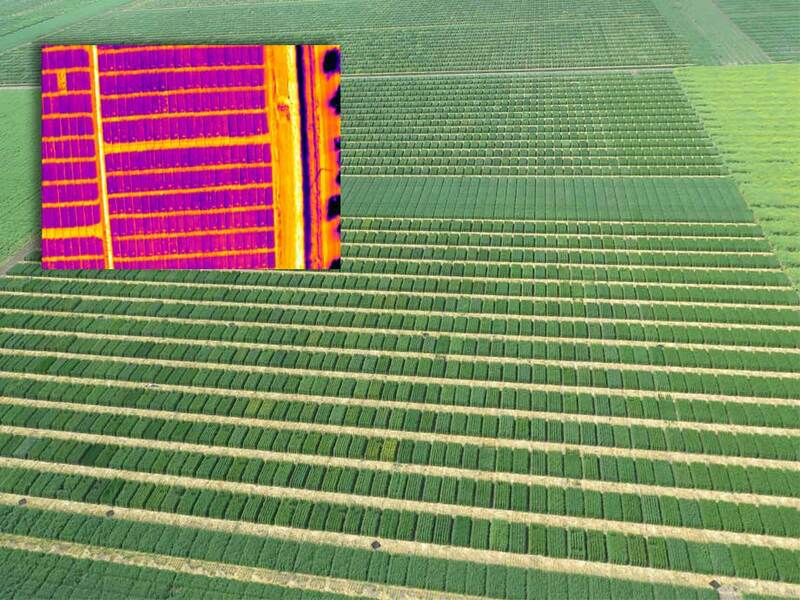 The Australian Plant Phenomics Facility CSIRO Canberra Node, the High Resolution Plant Phenomics Centre (HRPPC), offers a high resolution aerial thermography solution for the rapid measurement of crop canopy temperature in the field. Research has shown canopy temperature to be an excellent method of measuring crop stress through stomatal responses, and as such infrared imaging is becoming a popular technology within the crop science community. The imaging platform consists of a fully STC certified helipod that can be fitted to any R44 helicopter. The pod carries an advanced imaging payload consisting of a high resolution FLIR SC645 Infrared camera and 30MP RGB camera, with a fully integrated IMU and GPS. The imaging system is controlled by an onboard industrial PC computer, operated through a touchscreen monitor from within the cockpit. Provided with the imaging service is the ChopIt tool, a high throughput processing pipeline developed in-house by the HRPPC team. Thermal imaging using airborne thermography is an established technology for phenotyping plants for differences in stomatal behavior. Canopy temperature is a strong indicator of how well a plant is managing its water use through stomatal responses to environment conditions. The high resolution and high throughput capability of the phenoAir thermal imaging system allows for small differences in temperature to be detected between plant varieties making it a powerful phenotyping tool for large-scale experiments. RGB imagery can be used to construct whole of experiment mosaics and 3D point cloud reconstructions (using Pix4D software) for use in visual assessments. The HRPPC is currently working on extracting other valuable trait information from this RGB imagery. Suitable for: A variety of crops less than 1.5m in height. Can be adapted for row/vine crops (e.g. vineyards). The phenoMobile® Lite is an advanced mobile research platform designed to carry a range of instrumentation used for the high throughput phenotyping of traits in field conditions. The phenoMobile® Lite system is able to measure such traits non-destructively and considerably faster than traditional methods, saving both time and money. Fitted with an outdoor laser measurement scanner (LiDAR) and a computer, the phenoMobile® Lite scans trial plots from above to generate a 3D model of the crop canopy, which is then used to quantify specific traits such as biomass, fractional ground cover, and crop height. 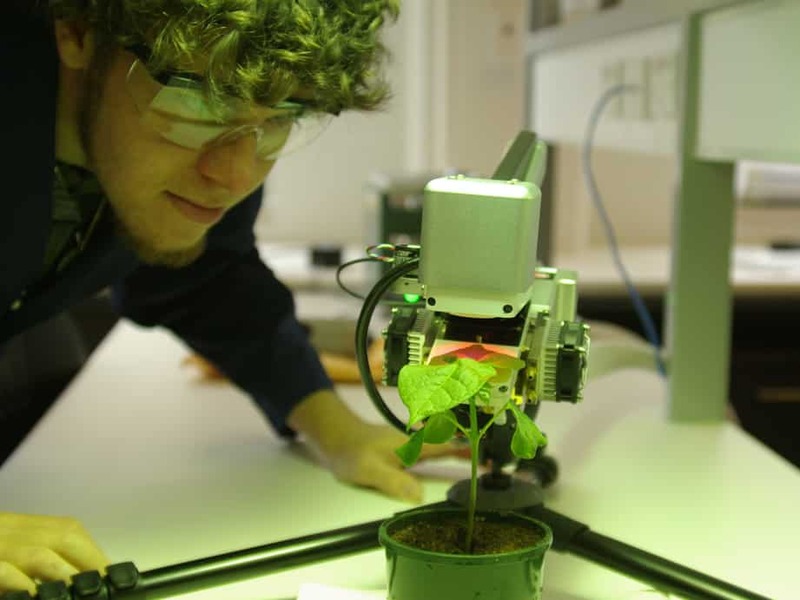 An RGB camera is also mounted to the adjustable boom to be used in plant counts. 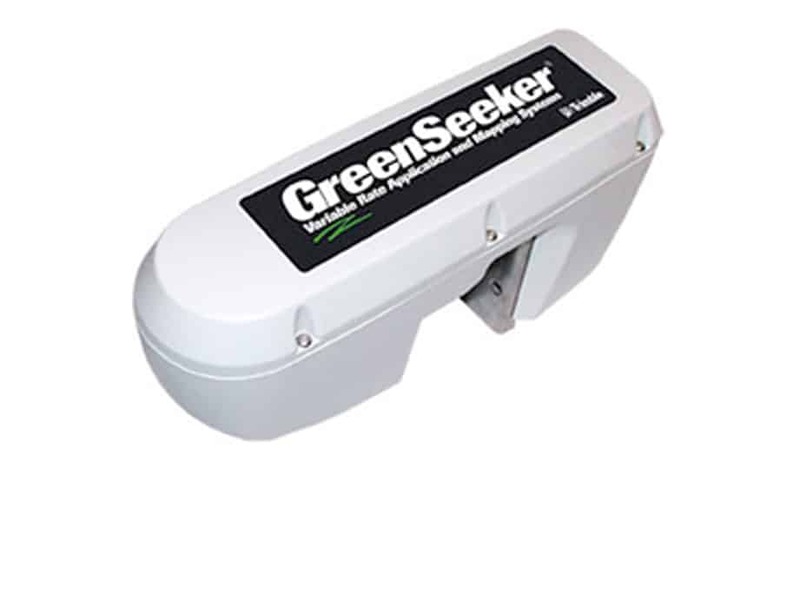 A GreenSeeker spectral sensor can also be mounted for NDVI measurement. The phenoMobile® Lite consists of a lightweight frame with adjustable wheel spacing (for different width plots) that is driven by a single electric wheel and guided from behind by an operator, allowing for smooth and easy operation. Collected data can be conveniently uploaded to the phenoMobile® Lite processing pipeline where data is then processed to derive above-ground canopy parameters on an individual plot basis. The phenoMobile® Lite has been successfully validated to be a surrogate for the non-destructive field phenotyping of both wheat and rice yielding estimates of canopy height, fractional ground cover, greenness vertical distribution, leaf area, plant counts, visual assessments, and with optional NDVI GreenSeeker, canopy density and greenness. Further crop applications are currently under investigation. phenoMobile® and phenoSMART® are registered trademarks of CSIRO in one or more territories in the world. Suitable for: All crops and pasture types. The Field Cropatron module contains 2 polytunnels (in total, 1500 m2 of enclosed growth space) located at the CSIRO’s Ginninderra Field Station. The control centre for the field cropatron is contained within a metal building adjacent to the Cropatron growth environments. Crops are planted directly into plots of soil within the polytunnels enabling plots to be worked by tractor consistent with standard field trial agronomy and monitored using existing HRPPC field module equipment including monitoring systems which provide high temporal resolution mapping of crop responses to the environment within the Cropatron. 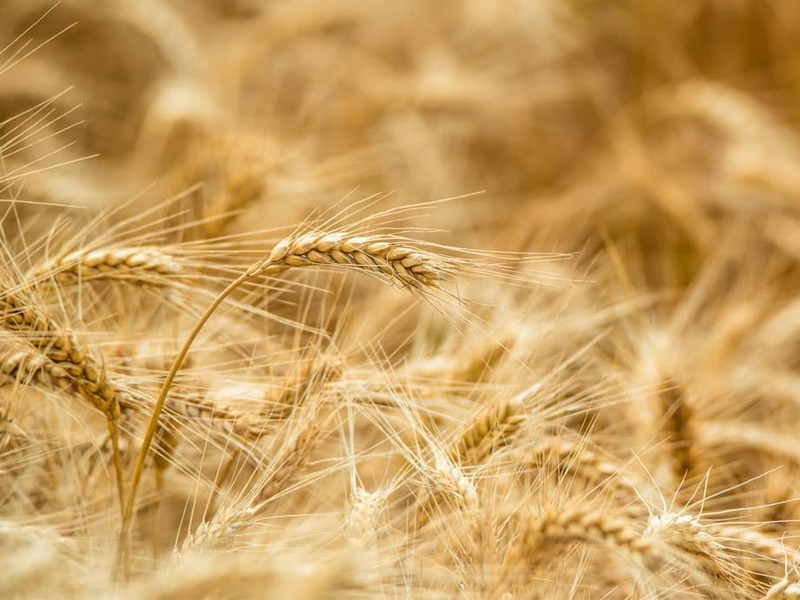 A variety of levels of environmental control and monitoring are provided, including temperature, light intensity, soil water availability via precision irrigation for drought experiments and a capability for CO2 control for climate change experiments. Includes: ArduCROP, ArduPAR, linear PAR loggers, ArduTHERM, weather stations, base stations and repeaters. Suitable for: Most crops and agricultural applications. The Phenonet Sensor Network includes: ArduCROP, ArduPAR, Linear PAR loggers, ArduTHERM, Weather Stations, Base Stations and repeaters. The CSIRO node of the APPF provides access to all elements of the phenonet sensor network as a package, or as stand-alone units. The phenonet services are also an end-to-end solution, APPF provides; R&D (including validation), deployment of hardware infrastructure, data acquisition and management, data analytics (including Web-based real-time visualisation, data aggregation and plotting) and on-going maintenance and servicing. One of the more popular phenonet services is the ArduCrop. The ArduCrop is an advanced infrared temperature sensor specifically designed for measuring crop canopy temperature under the extreme conditions of the field environment. 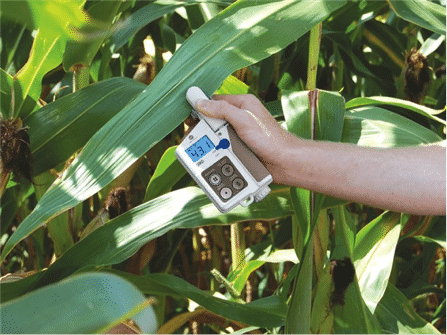 Research has shown canopy temperature to be an excellent method of measuring crop stress through stomatal responses, and as such IR thermometers are becoming widespread within the crop science and farming communities. 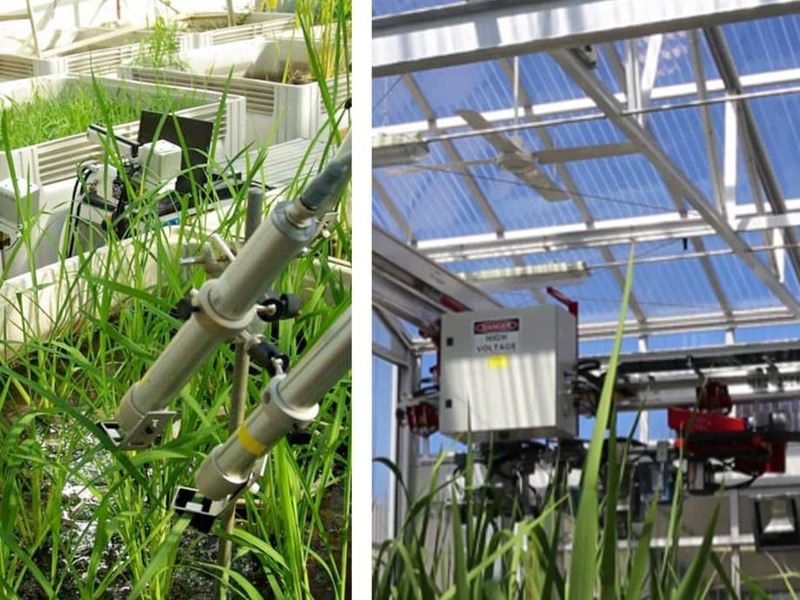 With a robust design, a high resolution sensor, and high throughput data capturing capabilities, the ArduCrop system is the ideal solution for field phenotyping research applications and irrigation management. The wireless ArduCrop sensor network consists of many individual sensor nodes that continually collect high precision temperature data from the field. Individual sensors relay data to a 3G coordinator base station that sends data directly to the HRPPC SensorDB website for real time data access and analysis through an online web portal. A standalone ArduCrop version with 3G capabilities is also available, which is better suited to smaller applications. Thermal imaging using IR sensors is an established technology for phenotyping plants for differences in stomatal behavior. Canopy temperature is a strong indicator of how well a plant is managing its water use through stomatal responses to environment conditions. The high resolution capability of the ArduCrop sensor allows for small differences in temperature to be detected between plant varieties making it a powerful phenotyping tool. As plant water relations are the basis of canopy temperature measurements, ArduCrop sensors are also highly effective for irrigation management. ArduCrops deliver timely information on the overall water stress of crops, allowing managers to make well-informed decisions for irrigation. Suitable for: Most crops and plant applications. Field and laboratory measurements. For more information on the LICOR 6400 photosynthesis system. For pricing, availability or more details (CSIRO): Please contact us by email or on +61 2 6218 3430. To submit a project please complete the request for service form. For pricing, availability or more details (ANU): please email or phone +61 2 6125 8319. To request a booking please fill in our web form to request a booking. 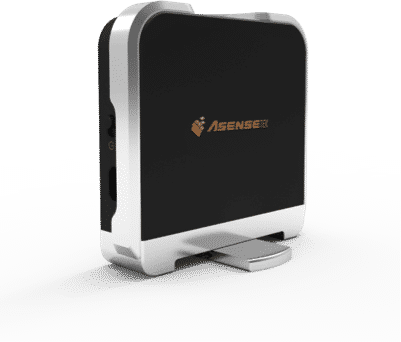 These instruments are rugged, portable, offer a high level of software and hardware integration as well as being renowned as the world leader in portable photosynthesis measurement systems. Suitable for: Most plants and leaf types. 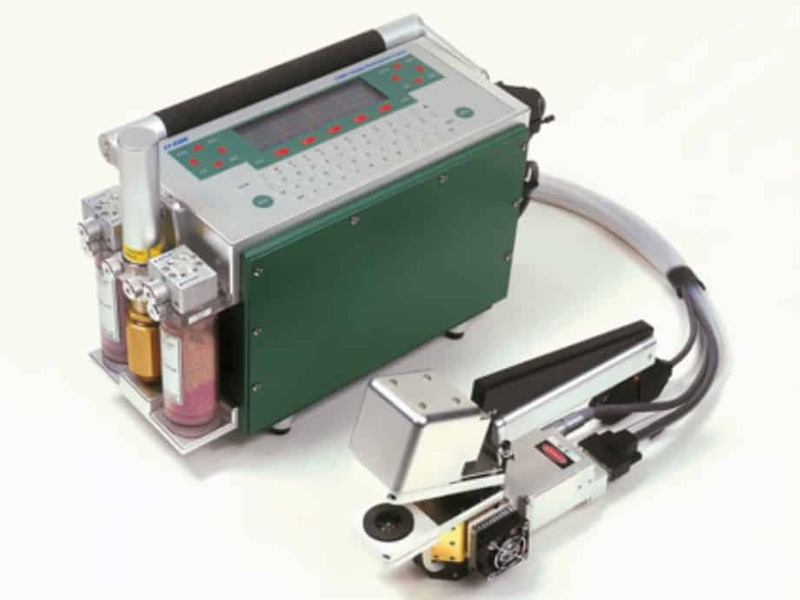 The FluorCam 800MF is a durable laboratory version of the FluorCam instrument for measurements on small plants, attached or detached leaves, algal cultures, etc. Fixed LED panels in the cabinet provide even irradiance over samples up to 13 x 13 cm. Selectable shelving system allows precise measurement of samples of diverse sizes. The cabinet may be closed for dark adaptation. Suitable for: Most crops and pasture types. The photosynthetic machinery that enables plants to convert sunlight to chemical energy has two means of dissipating light energy that exceeds a leaf’s needs: fluorescence, which is the instantaneous re-emission of light of another wavelength, and heat. Leaf fluorescence can also be actively stimulated with an external light source, and this has become a powerful technique for studying photosynthesis by individual leaves. An instrument at the APPFs CSIRO node is extending the approach to plant canopies by inducing fluorescence with an eye-safe laser. As the laser strikes a clump of leaves, light energy is absorbed by the pigment chlorophyll, and the amount of fluorescence is determined by both the amount of light absorbed and the amount not used in photosynthesis or released as heat. The laser is programmed to emit pulses of light in rapid succession, varied with pulses that are more spread out, and a detector continuously measures the amount of fluorescence occurring on the target leaves. For more information on the PhotosynQ MultispeQ v1.0. For more information on the Walz MONITORING-PAM chlorophyll fluorometer. The chlorophyll fluorometer MONITORING-PAM is designed for unattended, long-term and multi-site monitoring of chlorophyll fluorescence in air or underwater. At each measuring site, compact and robust emitter-detector units measure modulated chlorophyll fluorescence and perform saturation pulse analysis. For more information on the FieldScout CM 1000 chlorophyll meter. 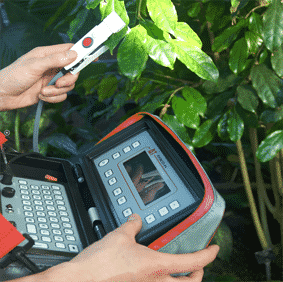 This handheld device is lightweight, quick and easy to use for chlorophyll content measurements. For more information on the PSI PlantPens. 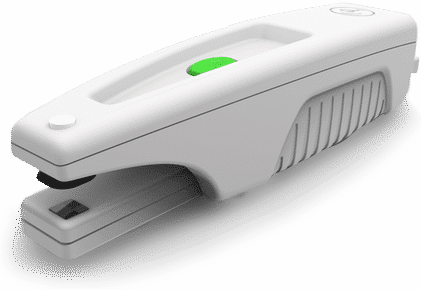 PlantPen is a reflectance-based device that provides a convenient, low-cost method of measuring the relative chlorophyll content of a leaf sample. PlantPens measure and calculate particular reflectance indices to assess chlorophyll content, protoprotecting carotenoids, and other important features in live foliage. Two standard Plant Pen versions measure the most common indexes: PRI and NDVI. The PlantPen model PRI 200 measures Photochemical Reflectance Index in two narrow wavelength bands centered close to 531 nm and 570 nm. PRI is sensitive to changes in carotenoid pigments that are indicative of photosynthetic light use efficiency, the rate of carbon dioxide uptake, or as a reliable water-stress index. As such, it is used in studies of vegetation productivity and stress. The PlantPen model NDVI 300 measures Normalised Difference Vegetation Index, which is an important indicator of chlorophyll content in plants. The device compares reflected light at two distinct wavelengths, 660 and 740 nm. The pigment in plant leaves – chlorophyll – strongly absorbs visible light (from 0.4 to 0.7 μm) for use in photosynthesis. The cell structure of leaves, on the other hand, strongly reflects near-infrared light (from 0.7 to 1.1 μm). The differences in plant reflectance in the visible and near-infrared wavelengths are used to calculate NDVI index. NDVI is directly related to the photosynthetic capacity and hence energy absorption of plant canopies. For more information on the Minolta SPADMeter 502. The SPAD 502 Chlorophyll Meter instantly measures the amount of chlorophyll content, a key indicator of plant health. 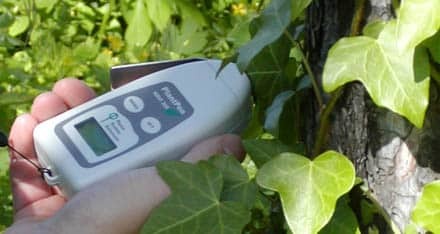 Simply clamp the meter over leafy tissue, and receive an indexed chlorophyll content reading (0-99.9) in less than 2 seconds. Easy to use to assess the health, or vigour, of a crop. 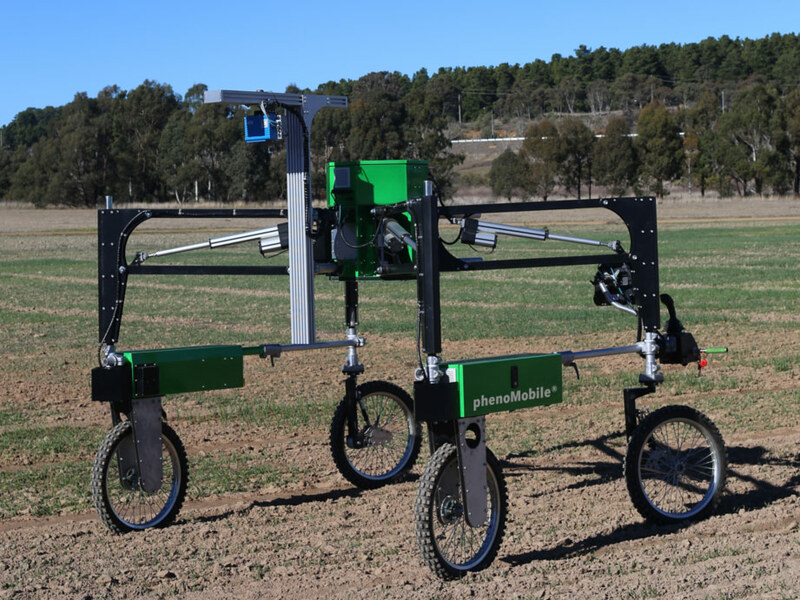 The CSIRO node of the APPF (the HRPPC), offers the use of a Trimble GreenSeeker 505 system that can be used in hand-held configuration as well as mounted to other field measurement systems such as the Phenomobile Lite. The CSIRO node of the APPF (the HRPPC), offers the use of 2 Analytical Spectral Devices (ASD) – FieldSpec® 3 portable spectroradiometers as well as an ASD Integration Sphere and 2 ASD Leaf Clips. These instruments are rugged, portable, offer an easy to use data collection/control software and are renowned as the world leader in portable spectroradiometers. For additional technical information. The LI-191R Line Quantum Sensor measures PAR integrated over its 1-meter length. 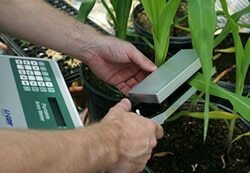 It is used to measure sunlight under a plant canopy, where the light field is non-uniform. The LI-191R makes it easy to measure under-canopy light in many plots quickly and consistently. It measures light in units of Photosynthetic Photon Flux Density (PPFD), which is expressed as μmol s-1 m-2. Suitable for: Ideal for measuring light conditions, e.g. inside growth chambers. For more information on the Lighting Passport. The Lighting Passport and software are very easy to use for most of your light measurement requirements. Measures up to 90 different parameters among the different available apps with up to 8nm Optical Resolution, 50~50,000lux Illuminance Range, 380~780nm Wavelength Range and 6ms~16s Integration Time. Allows precise rapid real-time remote light measurements with powerful and flexible Bluetooth Technology. The lighting passport can be perfectly integrated with most smart devices and offers a wide variety of intuitive apps to fit your needs. For more information on the Everest AGRI-THERM III handheld infrared thermometer. These infrared thermometers are designed for measuring temperatures outdoors. 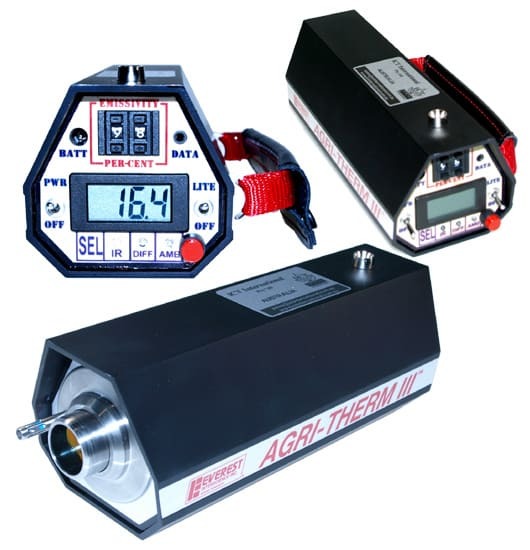 They have the capability to read the Surface Temperature, the Ambient Air Temperature (the Dry Bulb Temperature) and the Differential of these two readings. For more information on the Decagon Devices SC-1 leaf porometer. 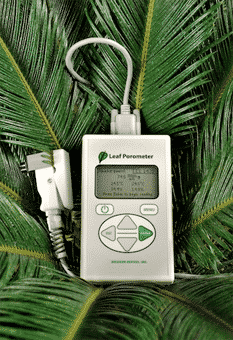 The SC-1 Leaf Porometer determines the stomatal conductance by measuring the vapour flux from the leaf through the stomates. Readings can be displayed as either conductance or resistance and saved for downloading later. For more information on the Delta-T AP4 leaf porometer. Suitable for: Most crops and plant applicationsin the field and laboratory. 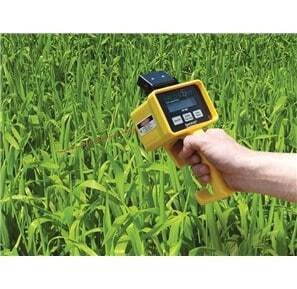 For more information on the LICOR leaf area meter 3000C.